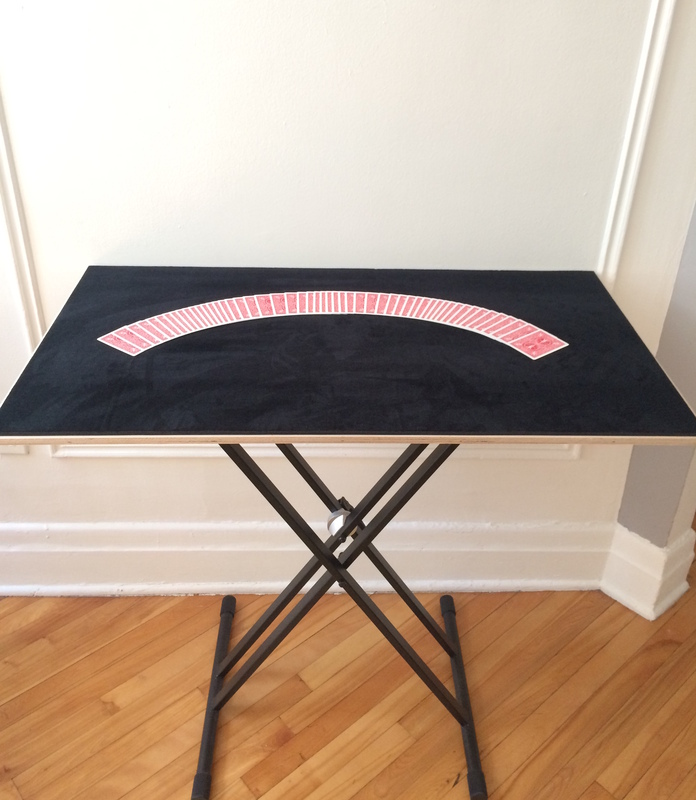 Here is the minimalist and portable magic table that I’ve been working on for months as a side project. After considering dozens of different retail tables and construction plans, I decided to build my own using strong, light and elegant material. The stand is designed to hold the weight of a keyboard and can be adjusted to various heights or folded completely flat.The board is 1/2 an inch of Russian pine. The surface is black velvet plush. I wanted to create a large performance space (20″ by 40″) to make a close-up magic stage that would also be suited to small-pitch work on the street or indoors. I’m considering adding a simple frame or some decorative trim to the edges of the table, but there is something nice about a simple and thin design. It conveys openness and makes the appearance, disappearance and transformation of objects more magical. If others have favorite tables for this kind of performance, I’d love to see them.